Home / Home, Judiciary & Safety / Women’s Participation In Judiciary On The Rise! Currently, the number of women judges may be meagre in the high courts and Supreme Court, but I believe that this scenario would change soon. Nowadays, more and more talented women are opting for a career in law. 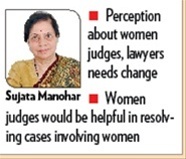 However, there are a few hurdles for women lawyers in becoming judges. The number of cases should not stop senior women lawyers who are eligible and qualified from being appointed as judges. Women judges are more compassionate towards women parties during hearings. In 1923, amendments were made to the laws related to women lawyers. Only after this could women get into the legal profession. However, after 30 years of women being allowed to get into the field, Anna Chandy became India’s first woman judge in the Kerala High Court. Today, after 90 years of the start, the high courts in India have 61 women judges in all and only one in the Supreme Court. Earlier, the mindset of society was reluctant in allowing girls into the legal profession. It was believed that women would fail to answer the sharp-edged questions of the opposition or would be unable to debate their side opinionatedly. The patriarchal society of the country never took the capabilities of women seriously. It was assumed that most women leave their law practice after they are married or have children. Because of these issues, it had become difficult for women lawyers to get cases and many of them left the field out of frustration. Today, the scenario is changing rapidly. More and more women are now taking up law to become lawyers or judges and are doing remarkable work. The society’s perception towards them is also changing. With the growing number of women in this profession, the number of women judges would also increase. seniority and capabilities, which is a slow process. Sujata Manohar, Former Supreme Court Judge.